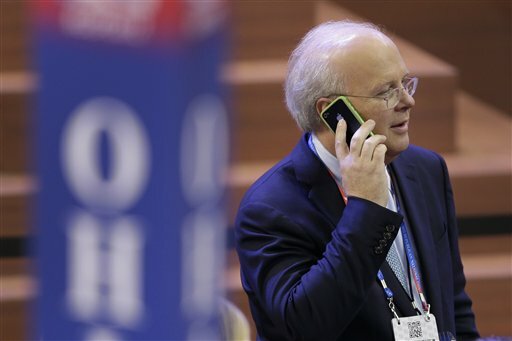 Karl Rove is one of Romney's most formidable weapons against Obama. Polls are looking better --not good, just better -- for President Barack Obama, but as one mystery Dem quoted by Politico says, it ain&apos;t over until Karl Rove sings. Polls have Obama up anywhere from 2 to 11 points, but things are so volatile that anything could happen. And, frankly, while Romney has been getting most of the attention for foot-in-mouth disease, Obama has had his share as well. Just this week, he barely made it out alive in an interview with Univisión&apos;s Jorge Ramos. 1. Rove. Oh, yes, Rove is still at bat for Mitt Romney. When you see his two PACs, American Crossroads and Crossroads GPS, pivot from the Romney-Ryan ticket to Congressional races, that&apos;s when you know the fat man&apos;s singing his song. But right now, Rove is still trying to energize the base and bring it home for Mitt. Obama has outraised Romney campaign to campaign and party national committee to party national committee, but Romney has much greater support among outside PACs. Rove&apos;s two groups alone are putting more than $8 million into the White House race in the next month, specifically aiming at swing states, and only about a $1.5 into House races. And Rove&apos;s groups -- which don&apos;t count when media talks about how Obama outraised Romney in August -- are just two of many. 2. Citizens United -- yeah, the group behind the Supreme Court decision -- will be running "The Hope and Change," a film featuring voters disaffected by Obama directed by the same guy who made Sarah Palin&apos;s “The Undefeated,” through Election Day. It started airing last week on six cable and six broadcast networks with the potential to reach tens of millions of voters. 3. The debates. I&apos;m actually less worried about the VP meet than I am about the presidential. Joe Biden -- media cartoon profile aside -- is a hell of a debater and has a long history of excellent debates. Paul Ryan, for all his wonky wonder, has never been seriously challenged in a political race or had much of a debate duel. But Romney got plenty of practice last winter and spring both in punching and in holding back. And while I think he&apos;s probably got more on the line than Obama, Obama can come off cocky, which never plays well. Moreover, Obama&apos;s committed his own gaffes of late and the Republicans are pouncing on anything and everything lately. Let&apos;s not replay the gift of "You didn’t built that." however out of context the GOP used it. 4. Voter I.D. laws in 31, possibly 32, states could impact final tallies. Among the swing states, Pennsylvania, Wisconsin, Florida, Michigan, New Hampshire and possibly Iowa, all have new rules affecting who can and can&apos;t vote -- and all negatively affect traditionally Democratic voter blocs. 5. Early voting has already started, and while that may seem to look good for Obama, it just totally depends. North Carolina, where Romney&apos;s ahead and which the Obama campaign has targeted, began voting September 6 -- before the Romney "47 percent" tape was revealed and the Libya gaffe. Wisconsin begins today -- before the VP debate. Michigan, New Hampshire, and Virginia all begin later this week, which may benefit the president. 6. Field ops. The Democrats have great game and always have compared to the GOP. But Marco Rubio’s senate primary win in Florida, Scott Walker’s recall victory in Wisconsin, and Ted Cruz’s race in Texas are all evidence of strong Tea Party down-on-the-ground operations. In Florida and Wisconsin, the GOP field game is formidable, combining both Tea Party and RNC forces. No matter what the polls say, the field outreach teams for the GOP could flip it in both of those states, if not others as well. 7. Unforeseen events. The embassy attacks are the tip of the iceberg in terms of world crises -- and be sure that Romney has learned his lesson about coming out too fast. He won&apos;t make the same mistake twice. In the meantime, keep an eye on Israeli Prime Minister Benjamin Netanyahu, who&apos;s itching for a war with Iran and would really like Romney to win the U.S. presidency.